It's Thursday again, that day I often begin under false pretenses. I muscle my way out of bed to my 8 o'clock microeconomics lecture, soothed with promises that after the 75 minute class I can drag my feet back to bed. This promise often proves empty, but I keep falling for it. Today instead of paying back the sleep I robbed myself of last night, I went to the library. Economics class always gets me thinking, early as it is in the morning, and during a recent class period I was possessed of a sharp ambition of writing a book like the pivotal (at least in the course of my own life) Terence Conran on Design, but about the market economics that underpin the modern world. Driven by this vision, I looked up the Library of Congress Classification for economics (HB) and made my way down to Purgatorio* to find it. 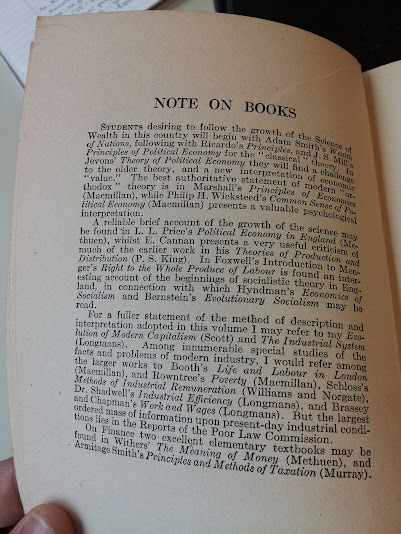 My ambition to read up on economics a bit before I start my book received a check in the form of the eight or so rows of HB-filled shelves. Sobered, I pulled a modest tome from this section and wandered toward a few of the other letters I'd scribbled down: HF (business), PR (wherever William Blake fits), and PN (where I found a book on theater design**). I spent a happy couple of hours at a table by a window with these books spread before me as in the days of my public-library-raiding youth, reading about the professional maid service industry and a summer camp for communications CEOs. As I neared the end of my camp-out, I looked through the list of titles I'd written down and realized I hadn't hunted up Graphic Design Before Graphic Designers: The Printer as Designer and Craftsman. Library of Congress Classification: Z246. I soon found that the shelves in Purgatorio stopped among the Ps. There was nothing for it. To the Inferno. I'd never been down the strikingly sterile stairwell with its white walls and bright lights before. I slipped through the metal gate at the top of them with a cool shiver of anticipation, the ringing of my sandals on the steps striking in the silence. Emerging at last into the bright world above with my stack of books and feeling (as I always do) roughly as though I've just raided a dragon lair (but trying to keep it cool on the outside), I go to lunch and make plans for diving back into real school work. And today, for my spirits if not for my droopy eyeballs, lair-raiding beats a nap. ** NaNoWriMo 2013 spoiler alert: This book is expected to be a major influence of this year's novel.